Every now and then I go out early on a winter’s morning to photograph the two flocks of sheep that spend the night near the house to keep their young lambs safe from predators. This was a little ewe and twins scene that I particularly liked. I decided to do it in oils this time. I love the way the lambs wait patiently for their mothers to get up in the morning so they can have their breakfast. Ewe with twins, early morning. 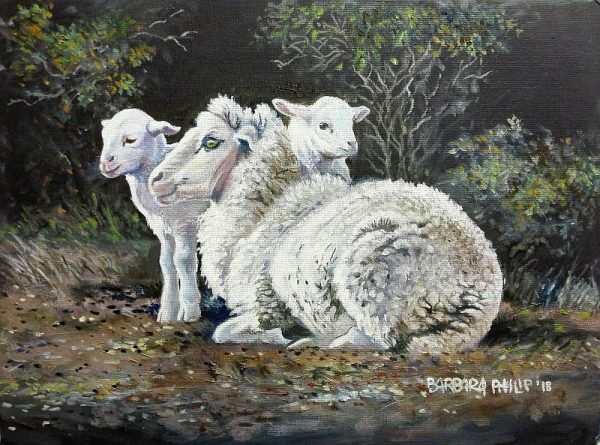 This entry was posted in Blog, Gallery, Rural Life & Karoo Landscape and tagged oil painting, Sheep. Bookmark the permalink. Post a comment or leave a trackback: Trackback URL.